Last weekend we packed up and headed to Detroit to visit my brother and to ski Mt. Brighton. Less than an hour from Detroit, Mt. 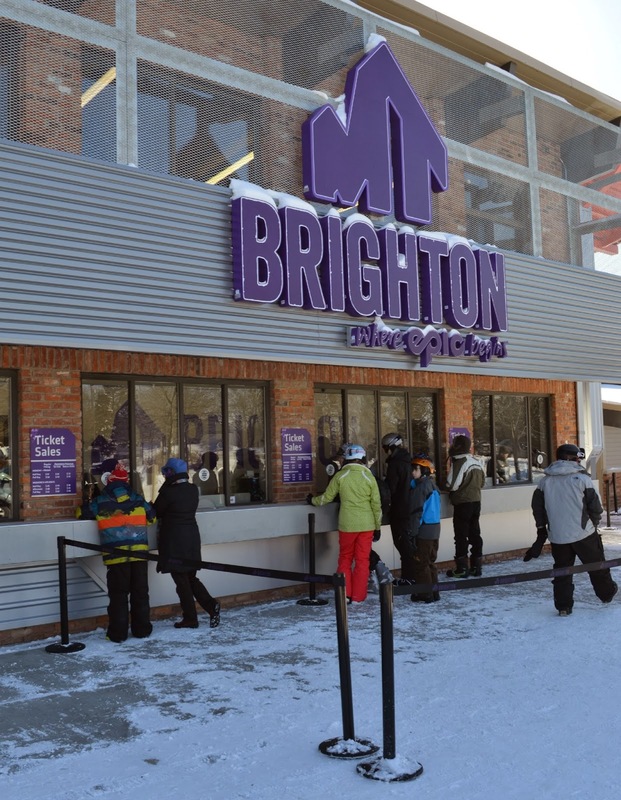 Brighton offers 26 trails and 5 lifts covering 130 acres. Since 1960, Mt. Brighton Ski Area has been one of the legendary family winter destinations on the Midwest snowsports scene. New owner Vail Resorts recently pumped in $10 million worth of improvements including new chairlifts, enhanced learning terrain, new base area facilities and children’s ski and ride school center, Michigan’s most innovative terrain parks, and a new powerful state-of-the-art snowmaking system. These upgrades help give Mt. Brighton the look and feel of a western ski resort. Offering trails for all levels, from beginner to expert this a place the whole family can enjoy. For beginners, the "magic carpet" (similar to people movers at the airport) makes getting up the newly re-graded beginners slope easier and improves the learning experience. This would have been ideal for our 3 year old, but unfortunately he decided he was not going to ski. :( The rest of the family enjoyed the trails and Tazer (12) also spent time in the newly completed terrain parks (5 parks geared for every age and skill level) which are the most innovative in Michigan. No racing for us this time, but if you're local and like racing, Mt. Brighton has race teams for all ages, plus Nastar and improved race terrain and state of the art racing equipment. From beginner to advanced - Mt. Brighton has terrain for everyone. For meals, skiers have 3 options at Mt. Brighton - pack a lunch, get grill food at Ski Hill Grill or full service at Ore Creek Mountain restaurant. If you choose to brown bag it, there is a separate cafeteria with picnic tables and ample room. The Ski Hill Grill offers a choice of pizza, burgers, fries and the like. There is also the new Bruhn Bar where you can grab a drink and watch some TV. For a sit down restaurant experience, head down the hall to Ore Creek Mountain restaurant. During our visit we decided to try out the grill. Our two older kids wanted pizza which was already prepared, but the rest of us wanted burgers and grilled cheese. Unfortunately we had to wait a long time in line for the grilled food. The burgers and grilled cheese were good - hopefully they can speed up the service. Mt. Brighton is easily accessible to skiers and riders from Detroit, Ann Arbor, Lansing, Northwest Ohio - and even Chicago (just over 4 hours, in good weather and no traffic). Another nice perk - if you buy an Epic Local Pass which allows you to ski Mt. Brighton for the season (and avoid the ticket lines), you also have the opportunity to use the pass at Vail Resorts’ western mountains which include Vail, Beaver Creek, Breckenridge, Keystone, A Basin, Canyons, Heavenly, Northstar and Kirkwood. Mt. Brighton - where Epic begins. Disclaimer: We received media lift passes as part of our visit. Not quite a Western resort, but definitely a step above the norm here. I like the whole bring your own food option.